One of the greatest Karateka of the 20th century and perhaps one of the greatest Karateka of all time is the venerable old Grandmaster of Okinawan Shorin Ryu Karate, Hohan Soken. The old master retired from the arts in 1978 and was one of the world’s most respected Karate figures in his time. In 1974, “Ripley’s Believe It or Not” bestowed this honor on Master Soken. In spite of this fame, the story of Hohan Soken’s career in the Martial Arts has rarely been told. His lifetime spanned the old and the new. During his life, he was his work in Karate grow from a secret Okinawan fighting method into a world-wide practice. Master Soken made great contributions to Karate and Kobudo. Hohan Soken was born on the island of Okinawa on May 25, 1889. This was the 24th year of the Meiji; history now calls this time period the Meiji Restoration. It was a time of great political upheaval. The old Ryukyu society was being completely modernized as were all areas of Japan. The old Samurai was being forced to abolish his way of life, to cut off his topknot hairstyle and work at whatever job he could find, usually working in the field as a common peasant. As if political troubles were not enough, the Ryukyu Islands experienced numerous natural disasters during this time. Since 1879, there had been numerous typhoons and epidemics of disease which had caused widespread death and destruction. So, for Hohan Soken, born into one of Okinawa’s most prominent Samurai families, the future was not very certain. As a young lad, Mr. Soken was forced to work in the fields beside the Okinawan peasants. So matters might have gone throughout Hohan Soken’s life except for his uncle, Nabe. Nabe Matsumura had learned his art from his grandfather, Sokon “Bushi” Matsumura. The famous Bushi Matsumura was Okinawa’s most famous Samurai; he founded Shorin Ryu Karate. Living past the age of 90, Matsumura had made his grandson, Nabe, heir to his Karate system. So, following the way of his ancestors, Hohan Soken began his Karate training at the age of 13 under the guiding hand of his uncle. Soken was Nabe Matsumura’s only student and was secretly trained in Okinawan Bushido, the art of the samurai. His training began in 1902 and continued for the next 76 years. Working in the fields by day and in the dojo at night was a rigorous schedule that developed physical strength and mental discipline. Following the custom for Karate students, young Soken also sought out other Karate Sensei to tutor him. At the same time he began training under his uncle, Hohan Soken also began training under another Karate Instructor, Ushi Tanme of Nishi-Hara village near Iho Beach. Ushi Tanme was famous for his Kobudo techniques. As Hohan grew to manhood, his martial arts training intensified. At the age of 23, Master Matsumura began instructing young Soken in the secrets of the White Crane, or Hakutsura. 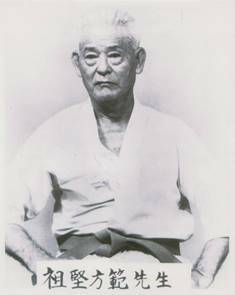 Many men coveted the knowledge of White Crane; even the venerable master, Gichin Funakoshi, sought instruction in this technique but was refused. Master Matsumura taught the White Crane only to Hohan Soken. Master Soken continued training under his Karate Sensei’s in Okinawa until the 1920’s and throughout the 1930’s. Under the Japanese influence, Karate in Okinawa during this time underwent a certain amount of change, and became more of a sport. Tournament sparring was introduced; stances became longer and wider. Japan was at war with China and many things of Chinese origin were discouraged. In 1936, even the name of Karate was changed from its former meaning, “Chinese Hand,” to “Empty Hand.” The Japanese were molding Karate into a sport, like Judo and Kendo. Meanwhile, Hohan Soken was living in Argentina, so his Karate did not undergo changes that Karate in Okinawa experienced. However, Hohan Soken researched his Kata and techniques, making variations where needed. In 1945, when he was 56 years of age, he returned to Okinawa and found Karate greatly changed. Unhappy with the changes he found, Master Soken refused to join the more fashionable Karate associations. He soon set about to teach his style of Shorin Ryu, Matsumura Seito Karate and Kobudo. Master Soken continued to research Kata and sent his students to learn from other Sensei throughout Okinawa. Much of the organized instruction of Kobudo found today originated from Master Soken’s efforts. Grandmaster Soken was active in the Okinawan Historical Society and President of the Okinawan Kobujitsu Association. Until his retirement in 1978, Master Soken was widely sought by Karate Sensei of many styles to teach advanced techniques in both Karate and Kobudo. Master Soken’s Karate Kata were Hakutsura, Naihanchi Sho Dan, Naihanchi Ni Dan, Chinto, Pinan Sho Dan, Pinan Ni Dan, Gojushiho, Kusanku, Seisan, Rohai Sho, Rohai Ni, Rohai San. Master Soken introduced the Pinan Kata into the Matsumura Karate-do. Those of us who practice Shorin Ryu Matsumura Seito practice Master Soken’s version of the Pinan Kata. Master Soken’s favorite Kata was the White Crane or Hakutsura Kata. He is the third generation since Bushi Matsumura to learn this kata. The only living man who knows this technique is Fusei Kise. Master Soken practiced and taught Kobudo with the Kama, Nunchaku, Bo, Kusari Kama, Sai, Tonfa, and Surchin. His favorite Kobudo kata was Tsuken Bo. Grandmaster Soken deserves a great deal of gratitude from karateka all over the world. He maintained a pure style, and his Shorin Ryu Matsumura Seito Okinawan Karate and Kobudo has remained much the same as it was in the time of his ancestors. He was instrumental in maintaining Kobudo as an active martial art and his efforts have led to the growth and development of the All Okinawan Kobudo and may have saved the art from extinction. For those of us who were fortunate enough to have trained with Master Soken, we have experienced something very rare. Karate practitioners always conduct themselves with proper etiquette. Without fail, bow to begin and bow to end when performing kata and kumite. When practicing, rouse your energy and pour in all of your strength. Practice devoid of energy is all the more an obstacle to progress. Watch and listen well to the teachings of yours instructor, your seniors and your seniors in the various other schools. Work hard and refine yourself, never forget (their Teachings). Looking and listening are both large keys to progress. As one improves, their importance becomes more apparent. Continue practice, even if a little at a time. Interruptions become an interruption or a step backward in progress. Learn the essence of your technique, watch over the state of your heart and plan out their development. “Technique” and “heart” are as “omote” and “ura” (two faces of the same entity). Beware of overdrinking and overeating. It is a rule that overdrinking and overeating lessen the effects of practice. Never lose the thought of improvement, never slacken (your effort). Self-conceit is a serious illness easily contracted during karate practice. Limitless is karate training. Work ceaselessly, and you will be surely become a Master. “I have taught you all I know. There is no more I can teach you. I am a candle whose light has traveled far. You are my candles to whom I have passed on my light. It is you who will light the path for others. Today I see around me the lights of Shaolin.